Integrated Monitoring of Coastal Areas. Coastal areas monitoring service based on the integration of satellite data, in situ data and numeric models. The IMCA project (Integrated Monitoring of Coastal Areas) aims at developing a system able to offer a service monitoring of coastal areas based on the integration of satellite data, in situ measurements and numerical modeling. Through regular production and distribution via the web of thematic maps, the project IMCA supports the monitoring of the quality and degradation of coastal areas and the analysis of the evolutionary processes of these areas. The project carries out a pilot sample areas default proposing as an objective monitoring of water quality, focusing not only on the control of major quality parameters of the aqueous matrix, but also taking in account the quality of the environment and ecosystem in its most broad meaning. For this reason the subject of our analysis was also the terrestrial subsystem, which influence the in front waters characteristics and, in turn, is modeled itself in its physical and environmental appearance. Maritime traffic (spread of pollutants in the marine environment, Oil spills). two areas on Adriatic sea inside the Provinces of Foggia and Lecce. The user interface is based on WebGIS technology to allow the data viewing / consultation / download from any PC connected to the network via TCP / IP (Internet) and then with a web browser can interpret hypertext pages and / or multimedia formatted according to the standard HTML or another. demographic, socioeconomic and environmental statistical data derived from official databases. 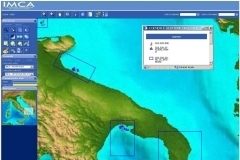 The system's database has been designed to comply with the technical definition of environmental data provided by ISPRA (former APAT, Agency for Environmental Protection and for Technical Services) at national level, in order to maintain consistency with the regulations and standards in force in Italy in the environmental field. This will allow in the future a high degree of integration between IMCA and other management systems of spatial information. The implementation of the model of evolutionary phenomena for specific areas of the coast can not ignore the availability of point measurements of the field , for a part of the project was devoted to the study and development of new sensors ( capable of acquiring laser scan measurements in dynamic mode ) in able to provide surveys of coastlines and beaches with a high execution speed and with consequent reduction of the times and the associated costs. IMCA is an industrial research project funded by the Ministry of Education. Its construction was started by a consortium led by Planetek Italia in cooperation with SPACEDAT, Coastal Consulting & Exploration, Department of Zoology - University of Bari, Department of Civil Engineering and Architecture, the Department of Physics and Engineering water and Chemistry of the Politecnico di Bari.